100% Wool Handmade fingerless glove glittens with a little flap to keep your fingers warm when you need it. 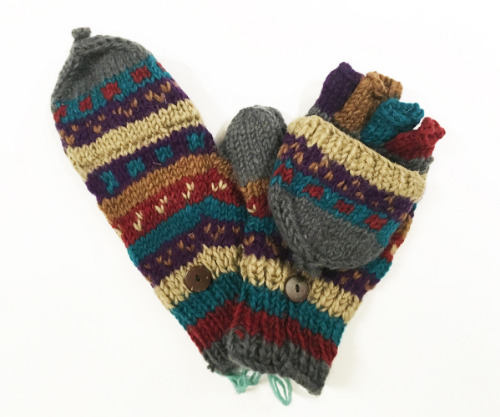 The mitten flap can be secured with a simple yarn loop to a button on the wrist. Since these super spiffy glittens are handmade, sizing will vary slightly from item to item but on average they are 10 inches long and 4 inches wide. They do have some stretch and are very warm in the winter time. This item comes in assorted colors and patterns. We choose for you! Unless otherwise stated glittenmeasurements are taken flat unstretched and NOT doubled.